Inspiration, Creation, Art By Jenny Pride. 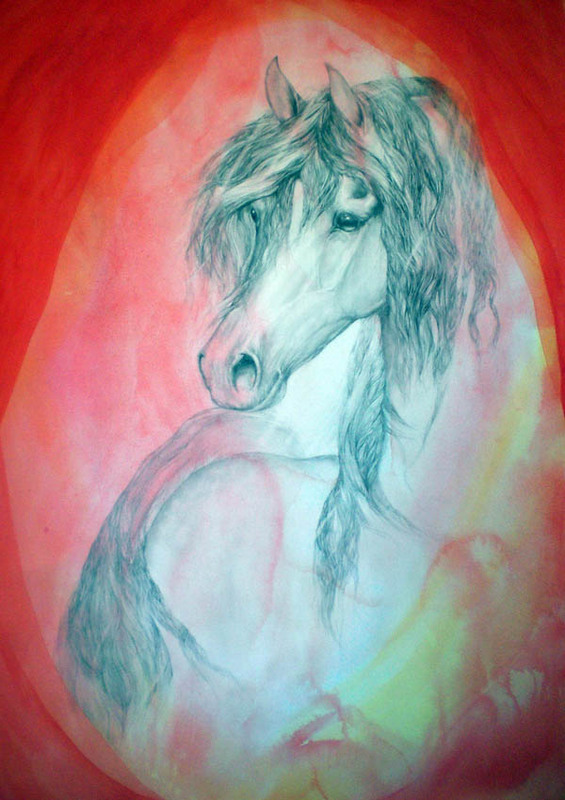 Welcome to my blog, a celebration of my art, nature, spirit and love for life! while living in the past is not something I want as a natural state of being , I welcome the tip- toe of childhood + teenage memories, especially after meditation, which opens the portal for Soul- making moments to flicker back into my mind. From very early willow tree climbing days, when at just 5 or 6 years old I quite understandably saw the topmost boughs of our 40 foot willow trees as my own exclusive Penthouse armchair! At that age, I then only dreamed of owning my own horse, (that day was still four years away..) but my birds nest view of our 3 acre paddock was a simply a green realm of possibility... I would watch 'National Velvet' the TV series, 'Champion The Wonder Horse' and of course, 'Fury' . My image- life was rich and scented with horse and Salix flower and the buzz of bees in the treetops next to me. 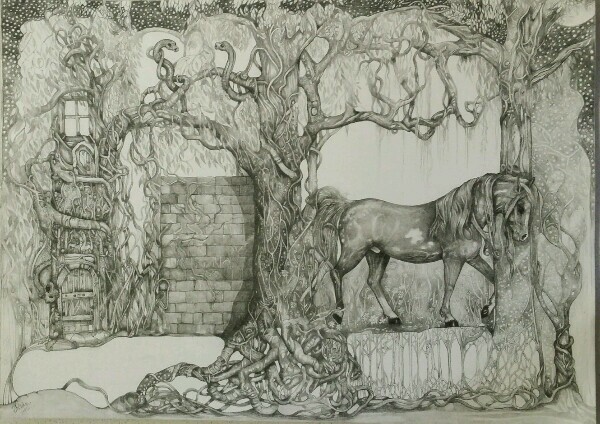 I'm sure that outdoor, nature rich childhood, which led to real horses from my 10th year, inspires my art and my Heart in ways I don't fully understand; .. drawings like this one, layered with meanings and the flow of memories ... will have to Speak for me. ..we would like to officially invite you to become a professional member of the International Guild of Realism. On the 12th of January, I received an email that changed my perception of my potential as an artist. Though we are constantly told we should not judge ourselves by the approvals of others, this is one vote that matters. Three months earlier, I submitted my art to the Guild with the hope and belief that my art has a place out in the fine art world. The welcome letter came as a pleasant surprise though, I was thrilled because this Organization holds as it's highest ideal the creation and promotion of realist art, which I love. I try with every piece to integrate the truth of the subject, while imbuing each pencil touch or brush stroke with love and Spirit. Thank you for your patience regarding our jury committee. From what we can see from the images you submitted via email and those we saw on your website, your work is of very high quality with regards to craftsmanship, composition and creativity. Congratulations! Our membership committee was quite impressed with your artwork and résumé. You certainly represent the style of artwork we seek to promote through museum exhibitions, gallery shows, and marketing articles. Therefore, we would like to officially invite you to become a professional member of the International Guild of Realism." Maternal Beauty and Strength in A3. 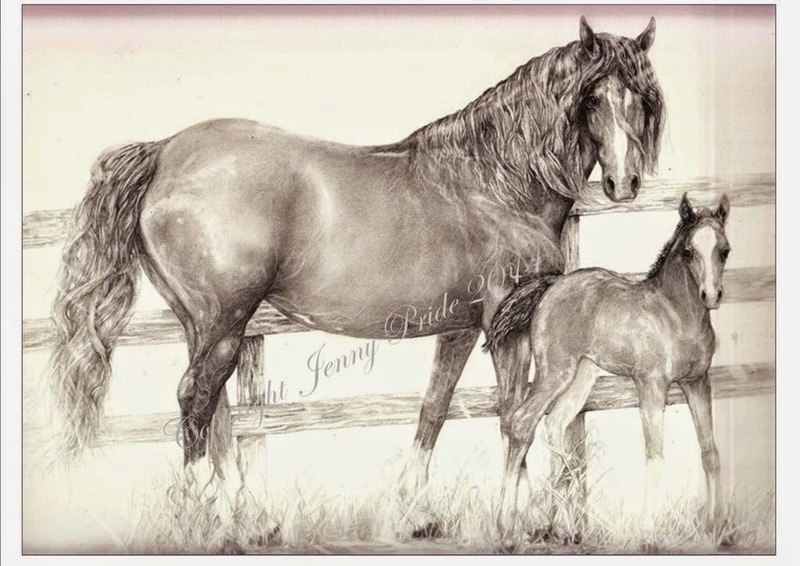 "Annie and Bella" blessed my Studio with their beauty, presence, and their palpable bond in July this year, but I couldn't yet share my progress pics as the artwork was a Commission from a daughter to her mum. But here they are, my vision of them anyway. My pencil marks on paper begged these girls' amazing essential essence to join me in moments of deep peace and remembering. 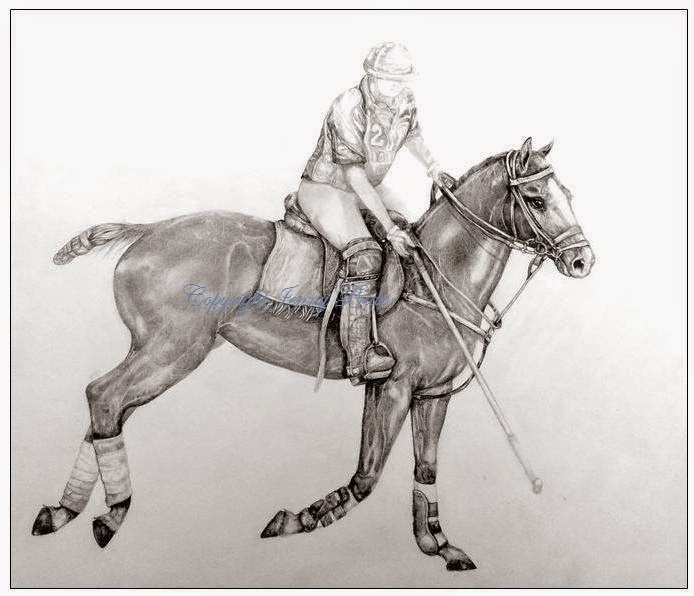 Beautiful polo pony whose name I never learned, her rider being the focus in the Clients' Commission.. shone with beauty, self awareness, a calm attention to her job. Allowing her rider to take the limelight, she asks only to be treated kindly. To remove saddle, bridle, martingales and boots, to roll in crystal sand bed.. horses need no recognition such as fame, winning, prize money; they move complete and fulfilled in their own Universe. "Kite Pally Play" Handcrafted pendant. "Kite Pally Play Handcrafted pendant. 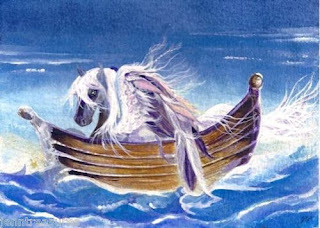 This pendant represents the freedom of a beautiful horse galloping free on a vast beach.. it is from a painting I did some years ago, and I find it inspiring to wear the similar one I created for myself..Kite Pally Play for Sale. 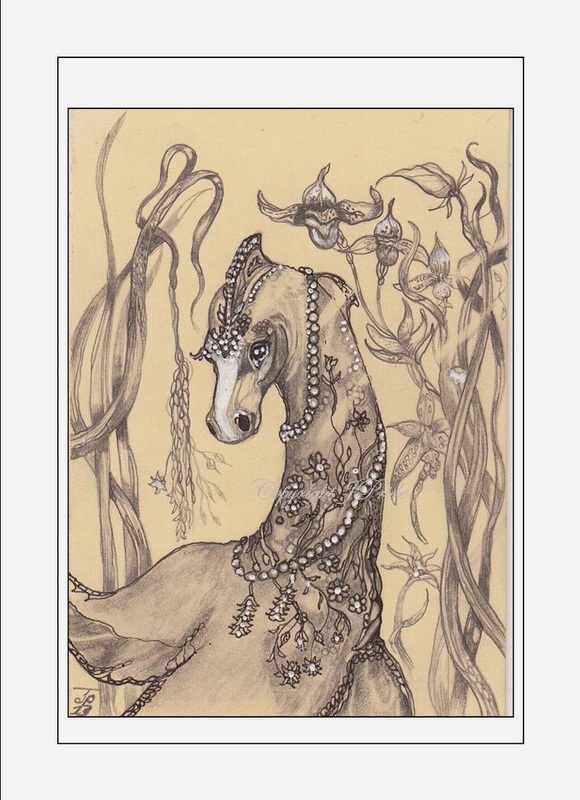 "Pearl in the Orchid Garden" Celebrating joy in nature. 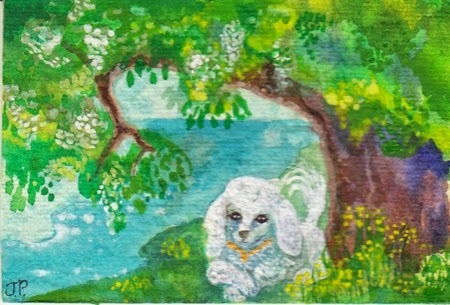 "Pearl in the Orchid Garden"
but loves to visit other realms..
adventure fills all her days..
brings Pearl a new place to play! I remember the Summer evenings of my childhood, playing out in the garden after tea, having water fights with my sisters and brother.. the smell of wattle, jasmine and smoke from a far off bushfire. The 'cool change' as a Southerly wind blew in, allowing some relief when we finally went to bed, no air conditioning back then.. a fan if we were lucky, but windows (with fly~screens of course) wide open to the night sky. And the flying jewels, the iridescent masterpieces of gilt wing and light~seeking radar. They were huge! And each so different from the other. If they got past the fly screens or followed us in before the screen door shut, we would carefully catch and carry them outside, placing them in the willow tree, or in mum's Camellias or Fuchsias, perhaps matching their colours to a flower where they might find company in their beauty. 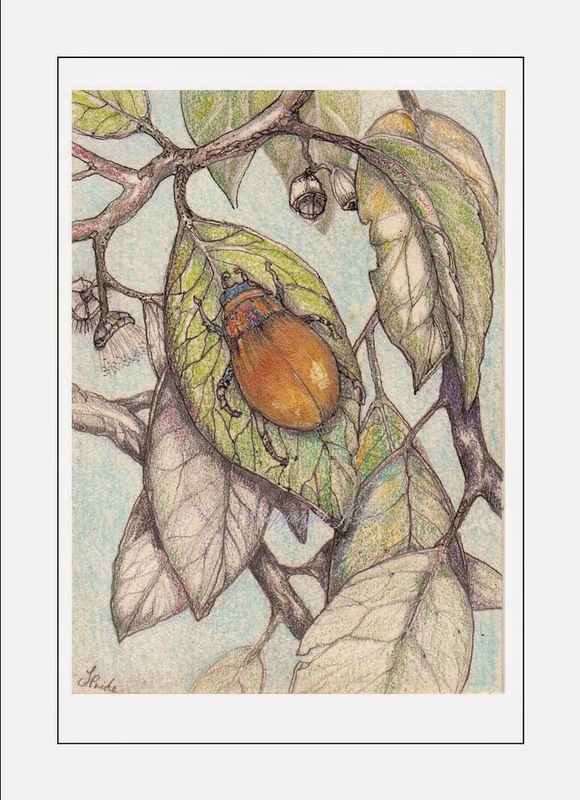 Mum taught us to be kind, to play in Nature, and to appreciate the colours around us, including those Christmas Beetles. Few are seen here now, at least in the Sydney Basin.. Pesticides? Tree Clearing? As with those othe jewelled treasures the Cicadas, the change in 40 years has been phenomenal.. Vale the Christmas Beetle. 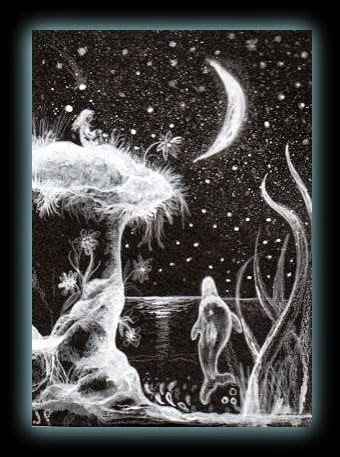 "Pearl in her Universe" original aceo in Graphite. with shafts of heavenly light dancing across his body, knees deep in what must be golden flowers, with stars and moons and angels dancing across his cheek and legs.. filaments of fairy dust adorn his heart~space. This is the embodiment of a little piece of every horse who has graced my life. 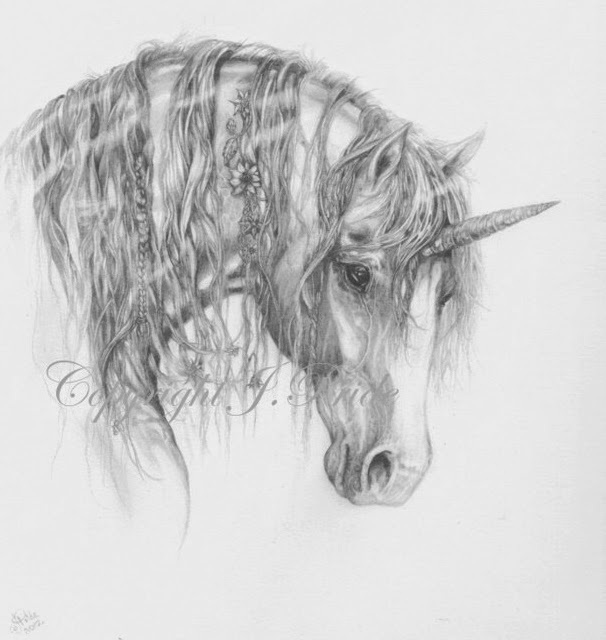 'Lumina' a new Unicorn Graphite Drawing.. 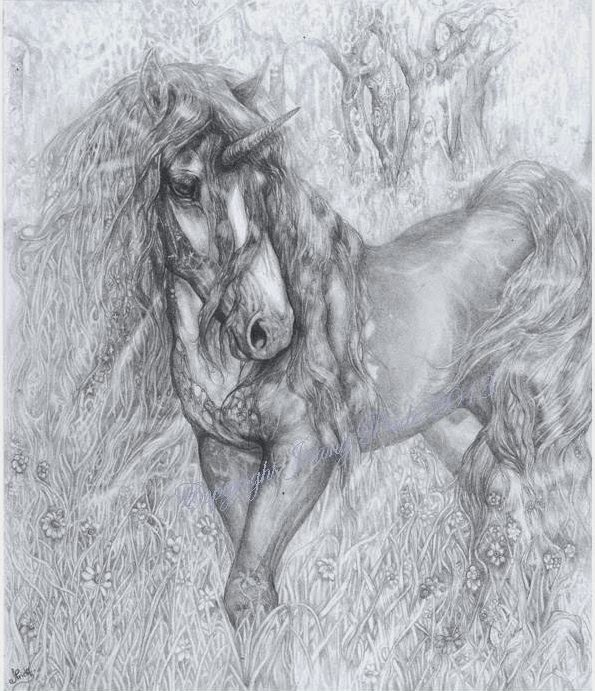 Created using .3 mechanical pencils on Fabriano Watercolour paper, this drawing expresses what I love most about the Unicorn: Gentility, exotic beauty, implied Strength and power, and their strong link to their cousin, the Horse. 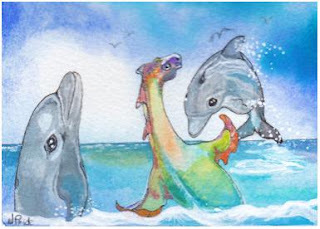 Pearl the many~coloured Sea Dragon has been playing again with her friends, the joyful pod of Dolphins.. giving me the opportunity to play around with watercolour on beautiful Arches watercolour paper. For sale on eBay, these little 'Art Cards' are a Collectible form of original art! 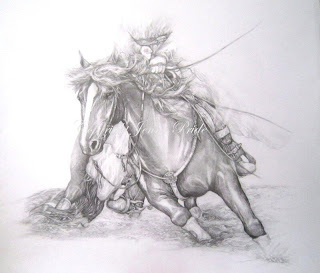 I joined a great Group of artists a few weeks ago, the 'International Equine Artists'. I was excited to see that there was an online exhibition just about to close entries! The Exhibition will be online for viewing from October 3. Voting for People's Choice open from 3rd October through to 31st December. 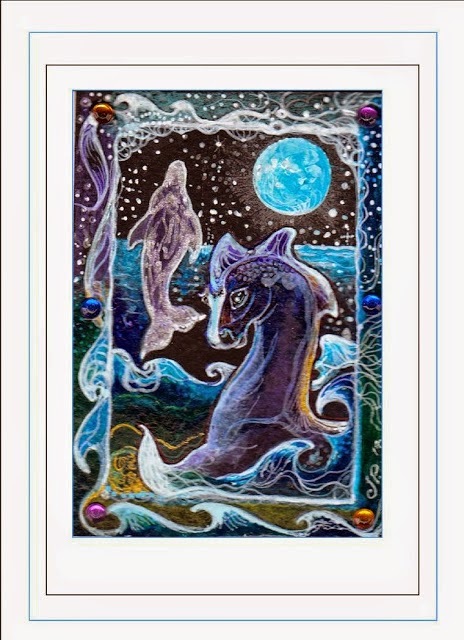 The beauty of creating art in miniature always thrills me especially after working on a large format Commission.. after many hours immersed in the patterns of the amazing Paint Horse "Our Incredible Story" (portrait pic coming soon..) I am back at the magnifying glass for a while! 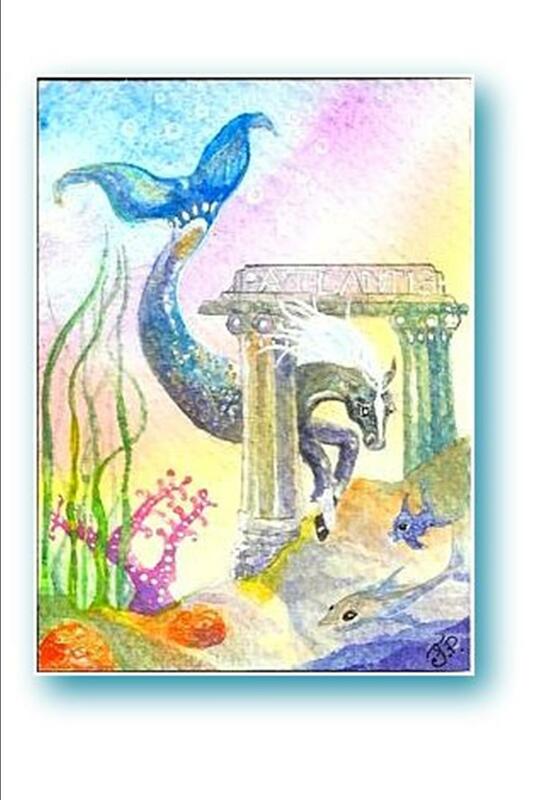 I painted this magical secret cove after once again being moved to tears by the tragedy of the Dolphins when their trusting nature allows them to swim too close to Taiji, Japan.. I urge everyone to go to "The Oceanic Preservation Society" today! Unicorns Arrived at my Website! They've been whinnying, stamping around the Studio, flicking manes and exotic tails, and generally doing everything short of poking me with their horns! 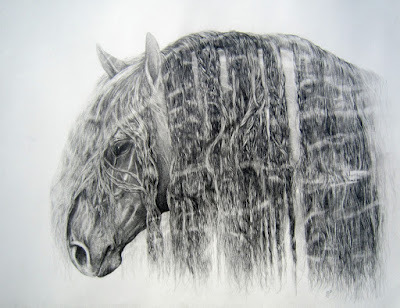 Finally I created their own page at Equinelegance, (and I have peace for a while) so I can continue with my commission of the beautiful Paint Horse stallion "Our Incredible Story". 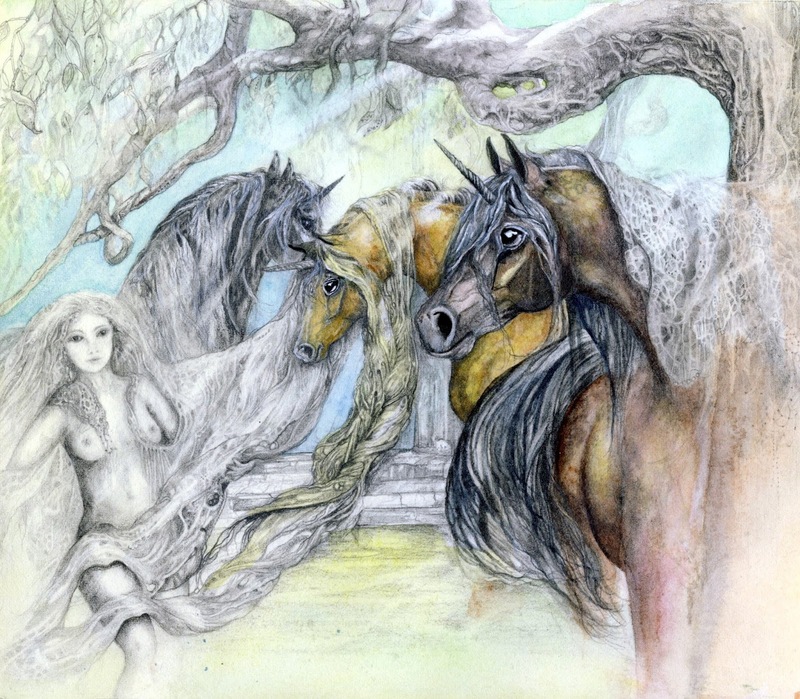 With my ancestors harking back to England and Cornwall, the deep greens of these places, the rich tumble of flowers alongside country cottages, and the vision of a beautiful palomino horse lazily swishing her tail.. (not at the flies.. surely that's my Aussie influence pushing in!).. these images in my mind are begging to be painted. New Cutting Horse in My Studio! WIP ~ Coloured Pencil Unicorn Stallion. This is one of my favourite poses in the horses'(or Unicorns') repertoire, this powerful view from the muscular hindquarters through to his focused eyes.. What better subject for my new exploration of shades of coloured pencil. Being so in love with pencil as a media, (but using mainly graphite), I have often used a little CP here and there in mixed media works. 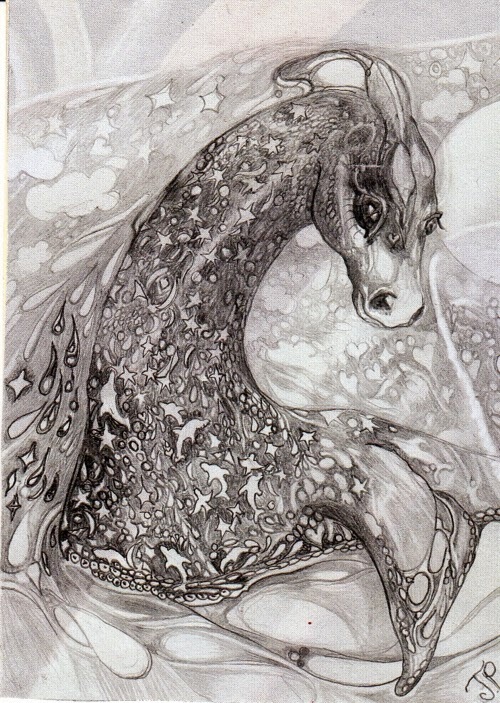 I am in awe of artists who create totally breathtaking CP drawings which can rival an oil painting in complexity and harmony....I will keep at it! 'Mother And Child' 4"x6" Watercolour. 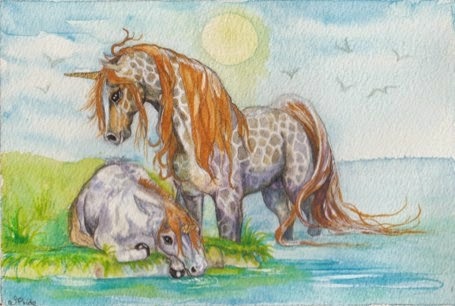 This is my second painting of the extremely rare Giraffe~Patterned Unicorns. 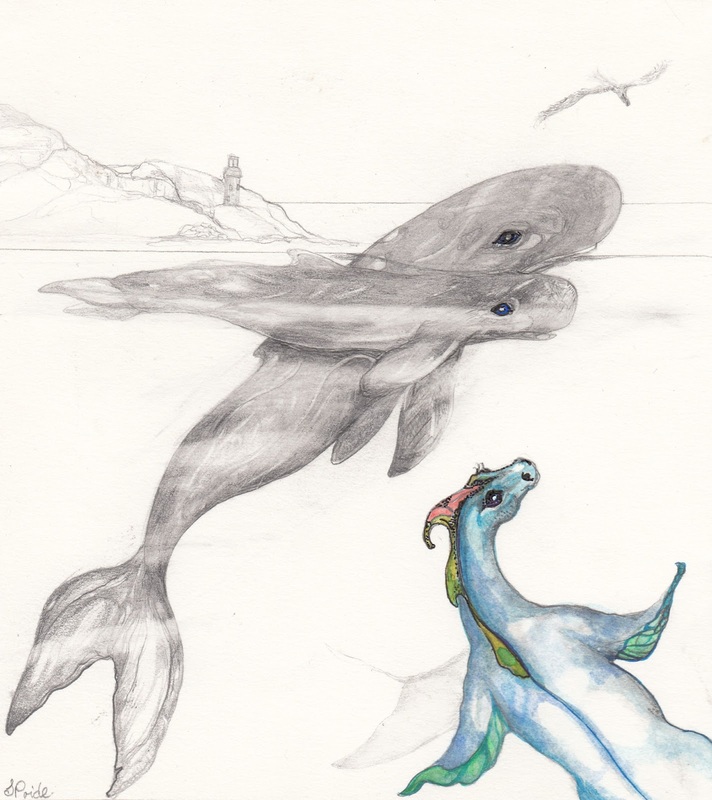 Found only on one Island in the Realms of Unicorn, these stunning animals are closely bonded to their herd lifelong. They love the Lakes District and can often be found cooling their heels in the shallows. Here a mare stands patiently while her young foal experiences the Lakes' healing waters for the first time. Pearl visited my studio again this week, calling me with her rainbow innocence and joy! 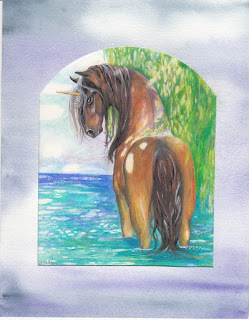 I listened, wanting to experience the colours she brings and the memories of her earlier visits and stories..
5" x 5" on Steinbach Drawing paper. draped in Love's "Bleeding Heart" flower..
special mare of his dreams. 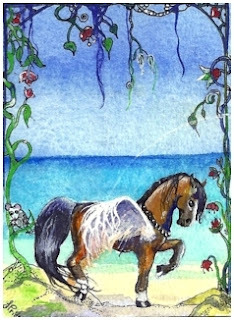 Bay horses, Beaches, Bleeding Heart vines.. Three of my Favourite Things.. SOLD. through miraculous myths and unbelievable colour and light. 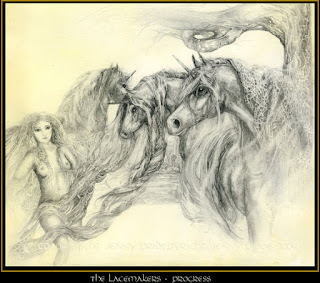 so dancing with light and magic, it stays in my heart long after my return to the studio! Rhapsody is the most beautiful of visions! Her soft pink and cream feathers delight all who see her. before reality and duty claim us again, a reminder that there truly is magic in the World!. 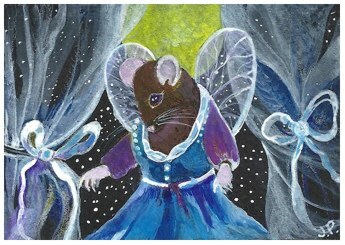 "Phantom and Pearl In the Caves of Light"
Pearl and cousin Phantom dance and play in vaulted shafts of light. 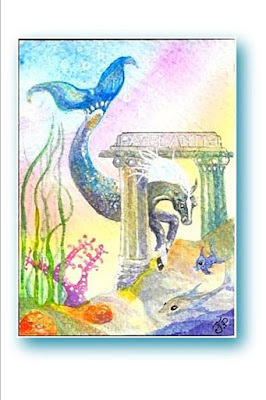 The cave's golden floors shimmer and sparkle, and Pearl loves to absorb their beauty! 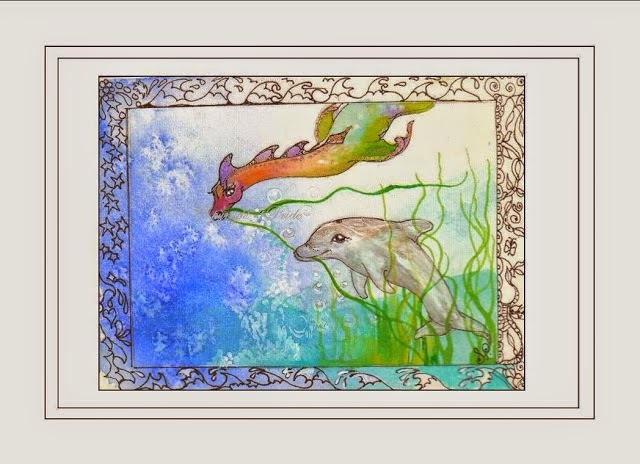 This little painting a miniature original painting of Pearl the Nature Helper sea dragon with her cousin Phantom, who have travelled again to the Far North Mountain~sea this time to visit the beautiful sea caves there.Medium: Watercolours and Atelier' Acrylics, including gold. Size: 2.5"x3.5". 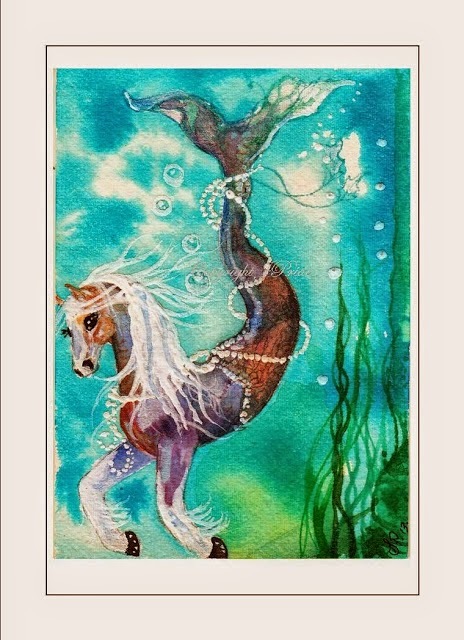 It is an ACEO, an "Art Card Original and Edition" ~ a very collectible form of Art. The vast expanse of Mother Ocean leads my imagination away on voyages through miraculous myths and unbelievable colour and light. 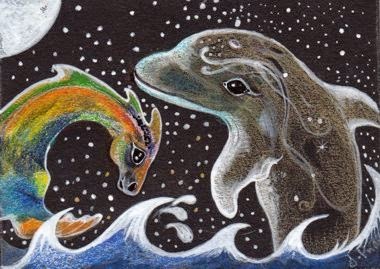 Sometimes I discover a scene so beautiful, so dancing with turquoise light and magic, it stays in my heart long after my return to the studio.. Baringa The Hippocampus is a far cousin of the horse, one who has a highly developed love of the water, a deep longing for adventure, and expression through colour. Baringa is an Aboriginal name meaning 'Light'. Medium: Derwent Inktense Watercolour. 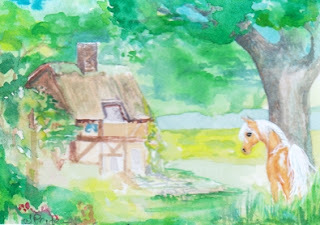 Size: 2.5" x 3.5" (6.5 cm x 9 cm) The painting measures 2.5"x3.5". 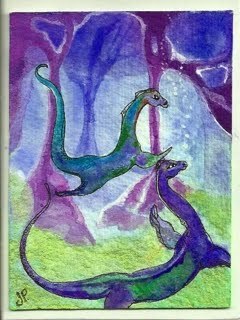 These are ACEOs, an "Art Card Original and Edition" ~ a very collectible form of Art. SOLD. who has visited my Studio in 4 earlier paintings. 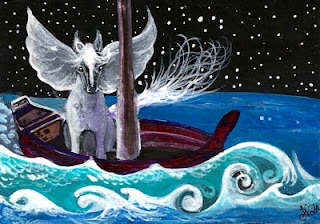 who wants to hop into Aphrodite's boat..
but who will cast them off from the Wharf? Perhaps the helpful seagull wheeling above? Work In Progress. 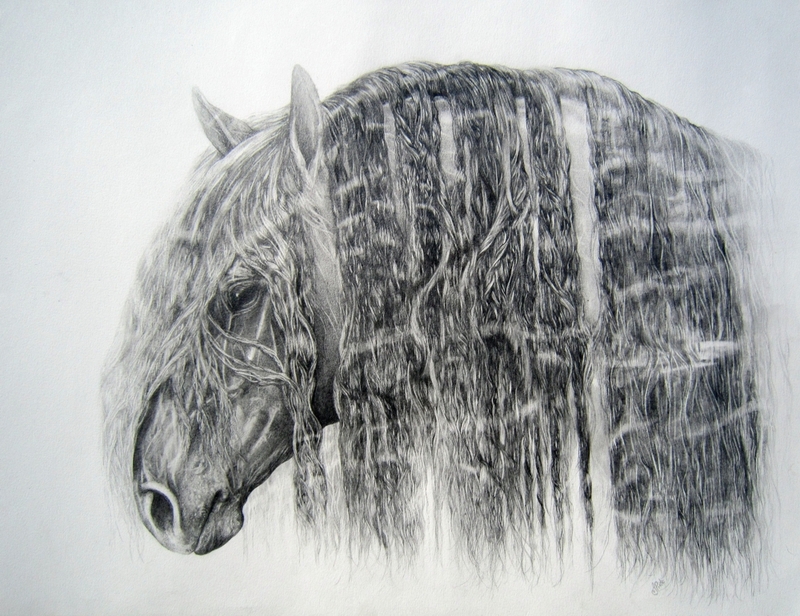 'Friesian Stallion'. 'Angel Foal' new Acrylic ACEO. Our animal art group 'Paw Prints Art Group' runs a Shop online, and one thing we like to do is to create art with a Holiday theme. This little one arose from my thoughts on Australia Day. On the long ocean journey taken by the First fleet from England to Australia. 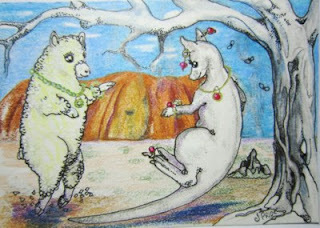 New ACEO, Australian Wildlife Whimsical ACEO. 2.5" x 3.5" Prismacolor Verithin pencil on Steinbach Fine Drawing paper. Mant trips into the outback were a feature of my childhood, as my Dad was born in the mining city, Broken Hill. The red earth, mulga scrub, the insects, kangaroos, emus, sheep, huge thorny prickles on the ground which always ended up in your undies after a 'toilet~stop' out in the middle of nowhere.. Memories all flooded back as I drew this little treasure. 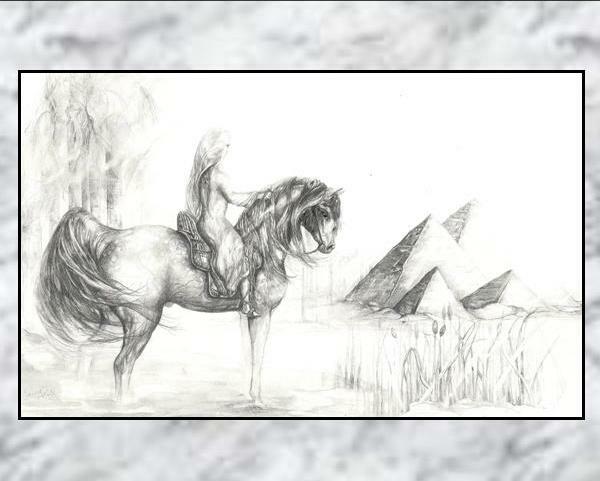 From a reference photo of a Lovely friend, Vanessa, on her trip to Egypt riding the beautiful grey Arabian, Gamil. (Used with permission). 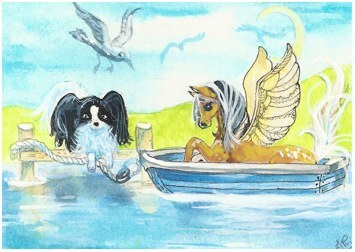 This is my entry in our eBay 'Paw Prints Art Group's Monthly Theme event. This month was to list a work of art with the letter 'J' involved.